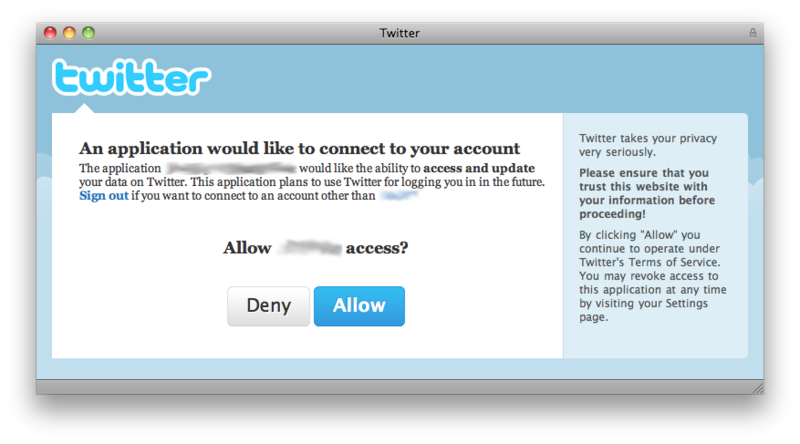 Twitter offers us three ways to authenticate using OAuth. The first, mostly for web applications, is to send a callback URL with your request, so after the user authorizes your application he gets redirected to the callback URL, and your app can proceed from that. The second, directed to desktop and mobile applications, is to use out-of-band authentication: after authorization, Twitter provides the user with a PIN code that he can type in your app to proceed. And the third one is to send the user’s login and password via xAuth. Although it may seem easier to use the last option, Twitter considers it the least desired way (as the user still has to type his password in your app), and to use it you need to directly ask Twitter for permission, sending details about your app and why you want to use it to api@twitter.com. In this guide we’ll use out-of-band/PIN code authentication, since this method doesn’t require you to set up a callback URL or ask Twitter for permission. First things first: if you haven’t done yet, go to Twitter Application Platform and register your app to use OAuth (yes, you can register a test application, no need for approval). After registering, write down the Consumer key and the Consumer secret for your app, as you’ll need them in a moment. I will eventually submit this fix to the author, but right now you can just change it yourself or use the version bundled with my code sample that you can download at the end of this post. It took me hours to figure that out. Update: thanks to Raphael Caixeta, I noticed I linked to the wrong version of OAuthConsumer (there are several different forks). He kindly created a ZIP file with the correct version, and you can download it here. Twitter’s OAuth authentication (using a PIN code) is a three step process. First you ask for a Request Token, then you redirect the user to a webpage so he can authorize your app and get the PIN code, and finally you ask for an Access Token. After that you just have to use that Access Token to sign every request you make. OAConsumer *consumer = [[OAConsumer alloc] initWithKey:@"CONSUMER_KEY"
After authorizing, Twitter will give the user a PIN code (7 digits) that he should write or copy. We’ll use this PIN code in the next step. Easy, right? We just get the response body and recreate our token using the new data. This new token is everything we need to sign our requests from now on. As long as you keep this token, you should never have to authorize your app again. The OAToken class even provides you with methods to store and retrieve this token, so you can keep it after closing your app and starting again. As you probably noticed, this post contains only code directly related to what I’m trying to explain. If you want the whole thing (including my modified OAuthConsumer) I’ve created a sample project including all the methods I used here and a very basic interface with some buttons you can use to call each method (and fields for consumer key, consumer secret and the PIN code). The sample project requires Mac OS X 10.5 (Leopard).